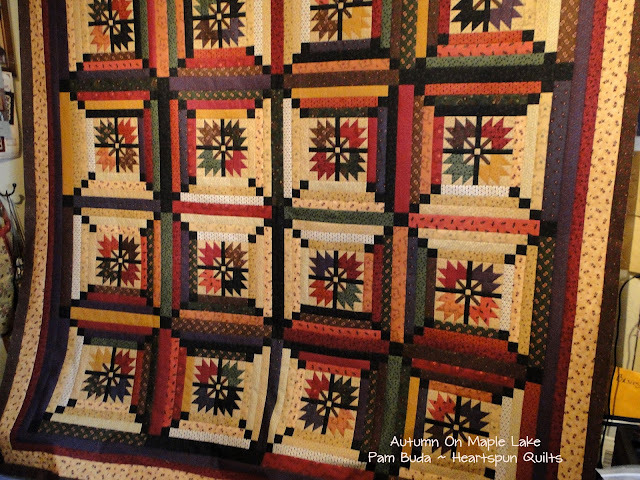 Last time, I posted this photo of the quilt Debbie was busily piecing called Autumn On Maple Lake. It's the large, feature quilt I designed especially for my new On Maple Lake fabrics. 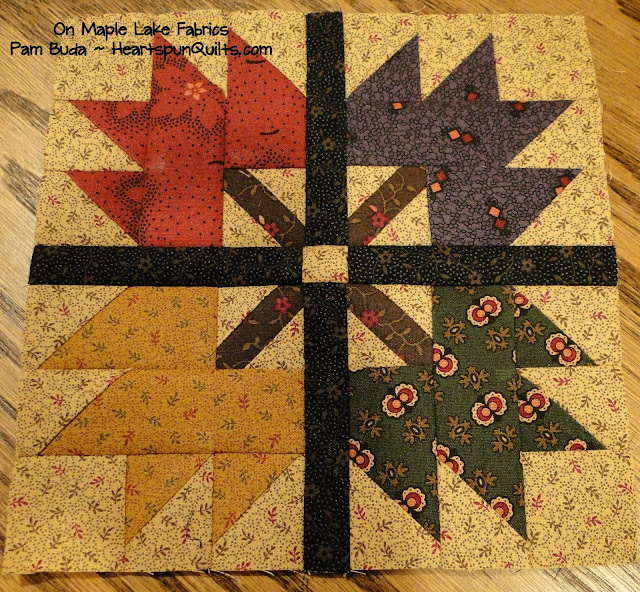 This is the whole block....a combo of Maple Leaves and Log Cabin. Love, love, love!! I took this photo of the quilt in progress and was so pleased to see the burst of fall colors! She took it back home to add the pieced border. I don't have a photo of the finished top because we rushed it to be quilted....but I can show you the Electric Quilt image of the entire quilt. It is really something in person as all quilts are. Photos never do justice to the real deal. My Autumn on Maple Lake pattern will be available soon. 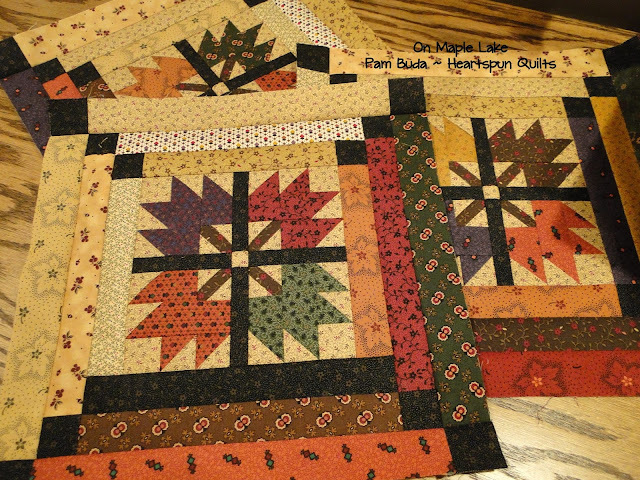 Click here to see all of the On Maple Lake prints....arriving soon at your favorite local quilt shop! Please be sure to ask for them on your next visit. Oh, my gosh, Pam that quilt is absolutely spectacular!! Can't wait to see the pieced border on it and it all quilted!! Love the combo of maple leaf and log cabin! Very creative! The colors are just wonderful. Stunning quilt and warm, gorgeous fabrics! The fabrics are so beautiful as is the quilt. Love it. Wow,fabulous quilt and yummiest fabrics! Love these fabrics and the quilt. Is there anyway to get on the mailing list when this comes out. Love your fabrics. Would love to make a retro quilt. I do not know what designers are my favorite. I do know you are one of them. I made your red quilt from last year, and I just completed the Letters from Grace quilt. I just need to get it quilted. I love all your quilts. I just wish I could make them all. Yes I have at least 3 that carry repo and civil war fabric. I don't have just designer, love them all! I know I got some of yours as well! I love this quilt, I can't exit to get my hands (and my stash!) on the pattern! I just love this pattern! I ordered the kit and I am just adding strip to log cabin blocks. It is going to be one of my favorites! Thank you for this beautiful pattern ! Scrap Winners & 2018 Civil War Cruise!! Time For Another Scrap Give-away!